The Rundown: Holly Throsby, from Sydney, Australia, started her professional music career in 2004, but began to take an interest in music at the young age of eight. Coming from a family with a rich background in music, Holly Throsby was destined for success. Her music is sometimes Folksy, sometimes Indie, and other times it’s Pop. Holly is also in a band with fellow Australians Sarah Blasko and Sally Seltman called Seeker Lover Keeper. 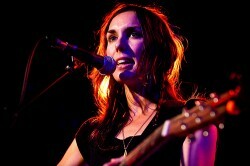 Holly Throsby has an elegant voice and a brilliant mind. Her lyrics are intelligent and thought-provoking. Her music is soft and comforting. Never one to stick to formal procedures, Holly’s music is not held down by anything. Quite often her music is whimsical, childlike, innocent and carefree. Experimenting with sounds is apparently something she greatly enjoys and is quite good at. MarsBands.com suggests that if you need to relax and lose your worries, that you take a listen to Holly Throsby. You won’t be disappointed.